By now, you’ve likely heard about the crisis in Flint, Michigan. Many of the children have lead poisoning due to tainted water. A state of emergency has been declared and an EPA administrator in the area has stepped down. The National Guard is sending in water bottles because residents can no longer drink their tap water. So, how did this happen? The more I learned about this crisis, the more terrified I became. Because this is a tale of extreme government negligence, and a cautionary tale for governments who think that they can cut corners at the expense of their citizens. Our story begins with the Flint River. The city of Flint, dealing with massive budget cuts and small tax revenue, decided to stop purchasing water from Detroit and to instead draw water from the highly erosive Flint River. The city claimed that this was safe, despite evidence that their numbers were doctored. In actuality, the river was highly corrosive, causing the pipes to leak lead into the water that thousands of people were drinking. The switch took place in April of 2014, and the public became aware of this crisis in late 2015, early 2016. But the EPA knew as early as April of 2015 that the Flint river was contaminated-and hid this information from the general public. Public health officials likely knew even earlier, in 2014, that the Flint River was the source of a Legionnaires outbreak that killed 10 people. In October, Flint started buying water from Detroit again, but the damage had already been done. Between June 2014 and November 2015, 87 people got Legionnaires disease due to the toxic water. 10 people died. 8,657 children under six were exposed to lead, the effects of which last a lifetime. The water that people had to drink was considered a “toxic waste”, and was causing hair loss and rashes. These lead levels also contribute to cardiovascular problems and kidney problems. All as a consequence of drinking water that is supposed to be safe. Worst of all, citizens are still being charged over $100 dollars for their poisoned water, despite them not being able to use it or drink it. Due to the gross neglect of Michigan’s government, there was also a huge political fallout. As I mentioned earlier, members of the EPA who hid the truth have been fired, and there have been calls against Government Snyder to be fired. There have also been public records requests for Government Snyder’s emails because it is very likely they knew about the toxic water when or soon after the switch. The Flint Water Crisis, in a nutshell, completely debunks the idea that the smaller the government, the happier the people (the government was actually celebrating after the switch). This was a town that was in a financial crisis, and the government assumed that if they cut corners on water and failed to just wait for the pipe they were building that everyone would be okay. The mayor of Flint confirmed this to NPR, saying that “profit” was put above Flint citizens. 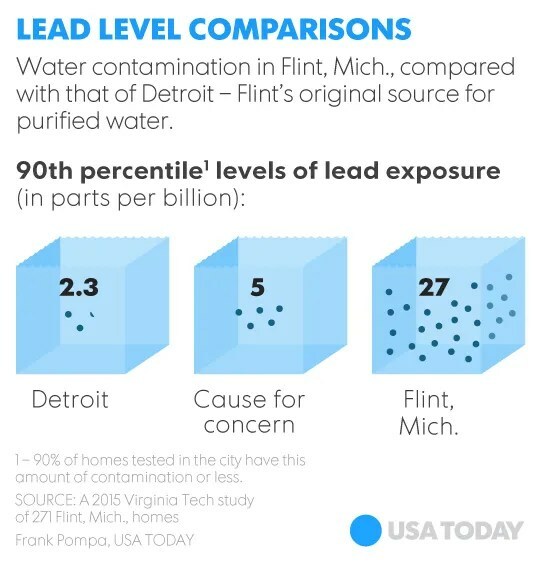 Something else that’s important is the fact that Flint is a town of mostly black people, and this isn’t the first time that a mostly black town dealt with lead poisoning. So, is this a case of environmental racism? We will likely never hear that from those responsible, but there is no denying that if this was a rich white town, this wouldn’t have happened. No matter the motivation for the switch, the political fallout is going to be epic. A friend told me the other day “whatever lawyer/movie-maker/journalist gets ahold of this is going to be set for life”. Why? Because government officials blatantly neglected the people they represent, resulting in the death of 10 people and the permanent health problems thousands of people now have to deal with. The Flint Water Crisis was the Republican dream turned into a nightmare for thousands of innocent people. There is no world where budget cuts should hurt the health and safety of civilians, and as a politician, the people you represent should be above your own ego. Unfortunately, it will be a long time (if ever) before Republicans and Libertarians realize this. So, what can we do right now? There are many charities doing water drives for the citizens of Flint, and places where you can donate money. It’s important that we give these people safe water, and help them through years of medical expenses. It’s what they deserve. Donald Trump’s a bigot. Not insane.